MICHAEL Jackson is earning more money in death than you ever will in life. And now he’s going to host the Grammys, in 3D. 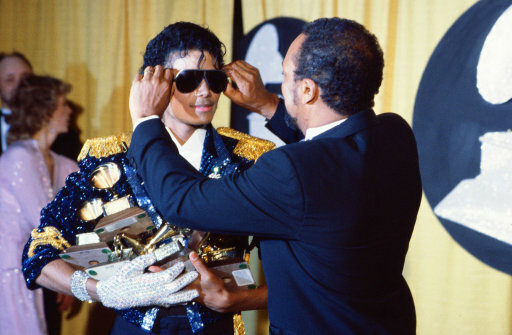 The Grammy Awards have stumbled onto a whole new way to exploit Michael Jackson’s memory, while at the same time hyping the January 31st CBS broadcast. The big night will include the broadcast of Jackson’s 3-D mini-movie “Earth Song” which was produced for his “This is It” concert dates in London, but has never been seen by the public. CBS is partnering with Target to provide free 3-D Grammy glasses. Michael Jackson is earning more money in death than you ever will in life. And now he’s going to host the Grammys, in 3D. Earlier, the Jackson Three, who must still think their dad is away on business, were given more money to muddle along. A US judge has agreed a £10,000 boost to keep the youngsters in the style they are used to. Lawyers acting for the children appealed to increase the amount to £55,000 a month, say court papers. They had argued that the current sum paid to Jacko’s mum Katherine, 80, was not enough to make ends meet. The Grammy Awards have stumbled onto a whole new way to exploit Michael Jackson’s memory, while at the same time hyping the January 31 CBS broadcast. The big night will include the broadcast of Jackson’s 3-D mini-movie Earth Song which was produced for his This is It concert dates in London, but has never been seen by the public.